The final wave of ballots for the 2016 Swamplot Awards for Houston Real Estate begins this afternoon! This week’s first new category open for voting is the Houston High Water Award. Which of the nominees on the roster have earned this prestigious accolade? That’s for you to decide! You can vote in 4 ways for this award — by commenting below, by emailing us, or by posting on Facebook and Twitter. Make sure all 4 of your votes count by checking out the official voting guidelines, posted right here; don’t forget to stir up support for your favorite nominees from your friends, and don’t forget that voting for all categories will end on December 27th at 5 pm. There’s the official roster — now, who’s earned the top spot? Let’s go for ingenuity and courage in the face of the flood: number 6! Frankly, number 2 should just apply for a Darwin award. #6, the self-reliant homeowner, for the win. I think there’s a fable about an ant putting away grain for the winter while the grasshopper is laughing at his preparedness? Totally that guy! #6 absolutely. Years ago Fox Sports had a production studio in an old butler building Gulfton. It was where they produced all 21 of the sports networks, and they had to deploy a similar inflatable dam across the loading dock every time it rained, otherwise the studio would flood out. As someone who lives nearby, I love how #4 performed. I really do. But I’m voting for #6, because there’s someone who knows his environment, made a choice to live there, and found a good, sustainable way to deal with it. Good for him. #6 for the win. He used tubes and water to outsmart the flooding. Congrats on his determination and grit. His insurance company should send him the mother of all popcorn/pecan tins for Christmas from now on!!! #2 for a separate Darwin award of stupidity. This guy is a professor in college?!? He drove around barricades and right past a reporter doing a live report on tv on the deep water and already submerged car. Wow. Then he is struggling to swim in water that is only knee deep. You can’t make this stuff up. A runner up in this category is the people who we see on the news that drive around the orange barricades into freshly poured concrete. I believe the last two were a mustang and a jaguar. Those tracks were easy to follow. Despite the fact that I nominated #2, I’d like to vote for #6. Because swampies should reward the good and smart, not the dumb. #4 & 5 would be worthy nominees as well. Number 5 just worries me, leave those leprosy infested rats to their own devices next time please. 6. Rosharon man fights the mighty Brazos…. and wins! Honestly how could it not go to #6. Drinking beer in the hot sun. 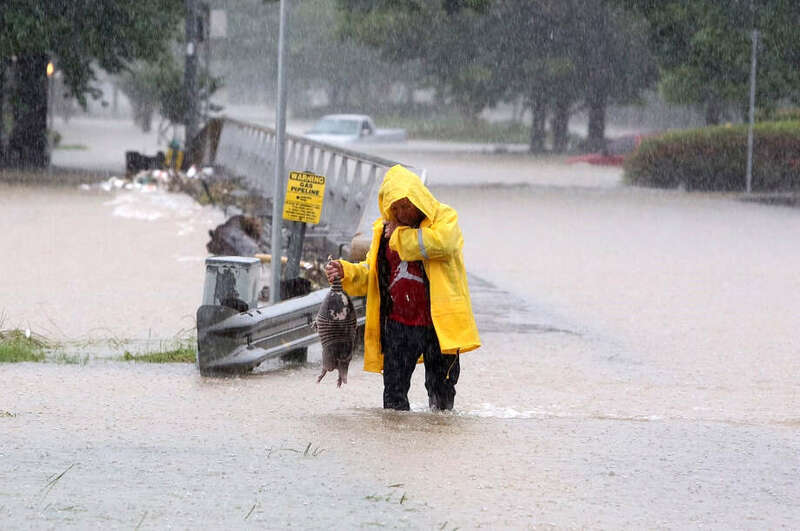 He fought the flood and he won. It seems many gripe and comment on Houston’s disregard for planning and flood prevention. But, these vast reservoirs and dams limited the damaged as designed. And, they weren’t even half full and with deferred maintenance. This system, the Addicks Reservoir, has been in-place for decades. In all the years growing up in the Houston area, I don’t ever remember seeing the reservoirs Barker and Addicks dams that high. Thankfully the dam held and the reservoirs emptied. Watching Clay Road close due to flooding not once but twice was historic in and of itself. Now let’s hope the next time Houston has Biblical proportions flooding, the Army Corps repairs will be finished. Honorable mention to the folks in Meyerland. It’s frustrating having to rebuild or remodel every time it floods. My heart goes out to those folks having grown up in Texas City, where it flooded all the time it seemed like. Number 4. The prescient design and good engineering involved in these structures is definitely appreciated. #6 I can just imagine him setting up his dam proudly waving his ‘Come and take it’ flag in defiance. #5, Armadillo for the win. # 5 hands down. This is why we love this place!! !